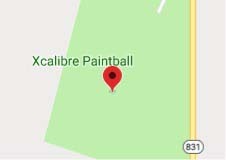 The following regulations respecting the use of the Xcalibre Paintball Park (the “Park“) located at Meridian 4, Range 19, Township 63, Section 9, Quarter South East (which property is owned by Mitzie Mytz) shall be adhered to by the user at all times. Failure to adhere to these regulations may result in immediate eviction of the user from the Park and the user may be prohibited from future use of the Park. The Park may only be used by the participant(s) authorized and approved by the Park. Participants must make arrangements and be approved to use the Park prior to the Park being used. The parties acknowledge that the Park may cancel any use of the Park at any time. Participants shall complete and sign a Release/Waiver and Indemnification Agreement with the Park prior to using the Park. Prior to and during the use of the Park, participants shall make its best efforts and take every reasonable precaution to prevent any injury to any person as a result of participants using the Park. Every participant using the Park shall remain in the area of the Park and not use or enter any other portion of the Park. Boundaries around the playing field are marked. During play, no players are allowed out of the boundaries without being considered out. Participants should bring enough rounds to last them an entire game since there is no re-entry permitted once you have left the boundaries. No unauthorized equipment. All paint MUST be purchased at the Park facilities. There are no refunds on unused paint, but may be marked by the Park’s employees for future use at the Park. Participants must be careful with the equipment. Participants may not leave any paintball equipment unattended between games. Safety masks are required at all times, with no exceptions. At no time during play is a participant allowed to remove his/her facemask. It is strictly prohibited to deliberately shoot at another participants’ head or neck area. There is no physical contact between participants. Do not overshoot another Participant. Follow the “Mercy Kill Rule” i.e. if you are within 20 feet of another participant, wait a second to permit them to surrender. If they have not surrendered, you are free to shoot them. Do not shoot another participant from any distance under 15 feet. In a critical situation, a participant can always surrender. A Participant is considered “out” when a ball hits them and breaks (the ball must break on the Participant) It is not considered a “HIT”, if the Participant gets paint splatter on them. It does not matter whether the Participant is shot by an opposing Participant or a teammate. When a Participant is marked, they must immediately call themselves “HIT”. They must then turn the safety on and plug your barrel. After a Participant is “HIT”, that participant must leave the Park area, and must not call out directions or locations of opposing participants. The “HIT” participant may not shoot at another Participant, or be shot by another Participant. No unadvised climbing on trees, structures or vehicles. Carry your guns by the handgrips and be sure not to hold the trigger while you are not in play. If you experience equipment difficulties, call the referee and they will assist you. If your gun is leaking air or CO2, place it aside, then call the referee. Under no circumstance may you tamper with the equipment. If you are injured, call a referee immediately. Referees under no circumstances may be hit, or have gunfire directed at them. No alcohol or illegal drug use is permitted.